Review: Running With Lions • Tips, Trends & News in 60 Seconds or Less! 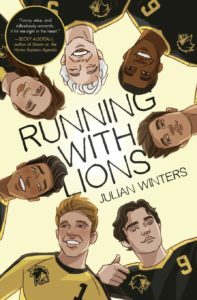 Julian Winters’ Running With Lions is another wholesome novel that fits right alongside Becky Albertalli’s Simon Vs. The Homosapiens Agenda and Ngozi Ukazu’s Check, Please! in terms of acceptance, friendship, and queerness. The reader follows the protagonist, recently-dumped soccer player Sebastian Hughes, as he enjoys his final summer at soccer training camp. Sebastian’s summer was a summer filled with chasing balls, teammate antics, and avoiding the oncoming stress of college. Everything was going perfectly. That is, until Emir Shah—former best friend, now callous stranger—joins the team and throws Sebastian the curveball of a lifetime. Not only is Emir infuriating, but he’s also incredibly hot and Sebastian’s summer becomes anything but easy. Winters uses the simple backdrop of the plot to highlight more serious issues such as sexuality and race. Unlike other authors who rely on stereotypical jock archetypes, Winters fleshes out the boys and the team by providing a layer of reality to all of the boys in the form of their unique dialogue and characterization. Representation and inclusion are both topics that Winters supplies readers with in this book. Running With Lions is an amazing novel for anyone wanting a tug on the heartstrings and a cute story about growth, love, and camaraderie. Nice job very proud of you keep up the good work.